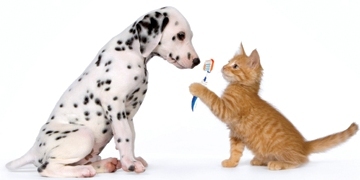 As we gear up for National Pet Dental Health Month in February, here are some tips on getting started with teeth brushing. Every cat needs clean, sharp teeth and healthy gums. Damage to the tongue, teeth, palate and gums can lead to many health risks for cats, but these can be prevented with regular veterinary examinations and good old-fashioned tooth-brushing—read on to find out more! A baby toothbrush or pet toothbrush that is an appropriate size for your cat. If your cat won’t tolerate a toothbrush, a small piece of washcloth or an appropriate piece of gauze (such as from a first aid kit) wrapped around your finger can be used. Treat or other reward your cat really likes. Note: Do not use human toothpaste or baking soda because these can upset your cat’s stomach. Toothpaste for cats comes in different flavors, like poultry or beef. You may need to try a couple flavors to find the one your cat likes best. The more your cat likes the toothpaste, the easier it will be brushing. Oh, Christmas Tree: Securely anchor your Christmas tree so it doesn’t tip and fall, causing possible injury to your pet. This will also prevent the tree water—which may contain fertilizers that can cause stomach upset—from spilling. Stagnant tree water is a breeding ground for bacteria, and your pet could end up with nausea or diarrhea should he imbibe. Tinsel-less Town: Kitties love this sparkly, light-catching “toy” that’s easy to bat around and carry in their mouths. But a nibble can lead to a swallow, which can lead to an obstructed digestive tract, severe vomiting, dehydration and possible surgery. It’s best to brighten your boughs with something other than tinsel. That Holiday Glow: Don’t leave lighted candles unattended. 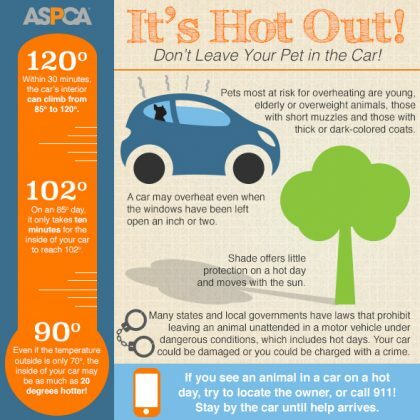 Pets may burn themselves or cause a fire if they knock candles over. Be sure to use appropriate candle holders, placed on a stable surface. And if you leave the room, put the candle out! Wired Up: Keep wires, batteries and glass or plastic ornaments out of paws’ reach. A wire can deliver a potentially lethal electrical shock and a punctured battery can cause burns to the mouth and esophagus, while shards of breakable ornaments can damage your pet’s mouth and digestive tract. Leave the Leftovers: Fatty, spicy and no-no human foods, as well as bones, should not be fed to your furry friends. Pets can join the festivities in other fun ways that won’t lead to costly medical bills. Selecting Special Treats: Looking to stuff your pet’s stockings? Stick with chew toys that are basically indestructible, Kongs that can be stuffed with healthy foods or chew treats that are designed to be safely digestible. Long, stringy things are a feline’s dream, but the most risky toys for cats involve ribbon, yarn and loose little parts that can get stuck in the intestines, often necessitating surgery. Surprise kitty with a new ball that’s too big to swallow, a stuffed catnip toy or the interactive cat dancer. House Rules: If your animal-loving guests would like to give your pets a little extra attention and exercise while you’re busy tending to the party, ask them to feel free to start a nice play or petting session. New Year’s Noise: As you count down to the new year, please keep in mind that strings of thrown confetti can get lodged in a cat’s intestines, if ingested, perhaps necessitating surgery. Noisy poppers can terrify pets and cause possible damage to sensitive ears. And remember that many pets are also scared of fireworks, so be sure to secure them in a safe, escape-proof area as midnight approaches. That’s how your dog might describe his crate. 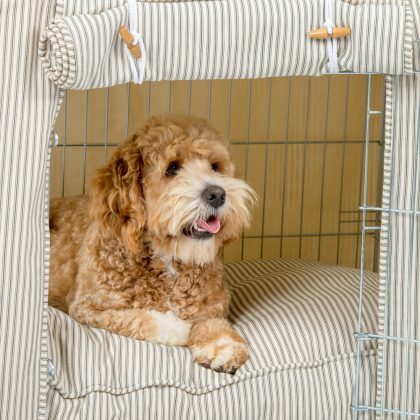 It’s his own personal den where he can find comfort and solitude while you know he’s safe and secure—and not shredding your house while you’re out running errands. The primary use for a crate is housetraining. Dogs don’t like to soil their dens. Crates are a safe way to transport your dog in the car. A crate isn’t a magical solution. If not used correctly, a dog can feel trapped and frustrated. Don’t leave your dog in the crate too long. A dog that’s crated day and night doesn’t get enough exercise or human interaction and can become depressed or anxious. You may have to change your schedule, hire a pet sitter, or take your dog to a doggie daycare facility to reduce the amount of time he must spend in his crate every day. Puppies under six months of age shouldn’t stay in a crate for more than three or four hours at a time. They can’t control their bladders and bowels for that long. The same goes for adult dogs that are being housetrained. Physically, they can hold it, but they don’t know they’re supposed to. Crate your dog only until you can trust him not to destroy the house. After that, it should be a place he goes voluntarily. Crates come in different sizes and can be purchased at most pet supply stores or pet supply catalogs. Your dog’s crate should be just large enough for him to stand up and turn around in. If your dog is still growing, choose a crate size that will accommodate his adult size. Block off the excess crate space so your dog can’t eliminate at one end and retreat to the other. Training should take place in a series of small steps. Don’t go too fast. Bring him over to the crate, and talk to him in a happy tone of voice. Make sure the crate door is open and secured so that it won’t hit your dog and frighten him. Encourage your dog to enter the crate by dropping some small food treats nearby, then just inside the door, and finally, all the way inside the crate. If he refuses to go all the way in at first, that’s okay; don’t force him to enter. Continue tossing treats into the crate until your dog will walk calmly all the way into the crate to get the food. If he isn’t interested in treats, try tossing a favorite toy in the crate. This step may take a few minutes or as long as several days. After introducing your dog to the crate, begin feeding him his regular meals near the crate. This will create a pleasant association with the crate. If your dog is readily entering the crate when you begin Step 2, place the food dish all the way at the back of the crate. If he remains reluctant to enter the crate, put the dish only as far inside as he will readily go without becoming fearful or anxious. Each time you feed him, place the dish a little further back in the crate. Once your dog is standing comfortably in the crate to eat his meal, you can close the door while he’s eating. The first time you do this, open the door as soon as he finishes his meal. With each successive feeding, leave the door closed a few minutes longer, until he’s staying in the crate for ten minutes or so after eating. If he begins to whine to be let out, you may have increased the length of time too quickly. Next time, try leaving him in the crate for a shorter time period. If he does whine or cry in the crate, don’t let him out until he stops. Otherwise, he’ll learn that the way to get out of the crate is to whine, so he’ll keep doing it. After your dog is eating his regular meals in the crate with no sign of fear or anxiety, you can confine him there for short time periods while you’re home. Call him over to the crate and give him a treat. Give him a command to enter, such as “kennel.” Encourage him by pointing to the inside of the crate with a treat in your hand. After your dog enters the crate, praise him, give him the treat, and close the door. Sit quietly near the crate for five to ten minutes, and then go into another room for a few minutes. Return, sit quietly again for a short time, and then let him out of the crate. Repeat this process several times a day, gradually increasing the length of time you leave him in the crate and the length of time you’re out of his sight. Once your dog will stay quietly in the crate for about 30 minutes with you mostly out of sight, you can begin leaving him crated when you’re gone for short time periods and/or letting him sleep there at night. This may take several days or several weeks. After your dog can spend about 30 minutes in the crate without becoming anxious or afraid, you can begin leaving him crated for short periods when you leave the house. Put him in the crate using your regular command and a treat. You might also want to leave him with a few safe toys in the crate. Vary at what point in your “getting ready to leave” routine you put your dog in the crate. Although he shouldn’t be crated for a long time before you leave, you can crate him anywhere from five to 20 minutes prior to leaving. Don’t make your departures emotional and prolonged—they should be matter-of-fact. Praise your dog briefly, give him a treat for entering the crate, and then leave quietly. When you return home, don’t reward your dog for excited behavior by responding to him in an excited, enthusiastic way. Keep arrivals low key to avoid increasing his anxiety over when you will return. 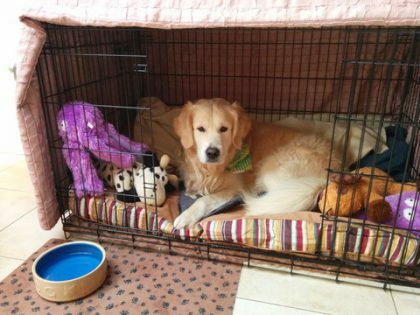 Continue to crate your dog for short periods from time to time when you’re home so he doesn’t associate crating with being left alone. Put your dog in the crate using your regular command and a treat. Initially, it may be a good idea to put the crate in your bedroom or nearby in a hallway, especially if you have a puppy. Puppies often need to go outside to eliminate during the night, and you’ll want to be able to hear your puppy when he whines to be let outside. Older dogs, too, should initially be kept nearby so they don’t associate the crate with social isolation. 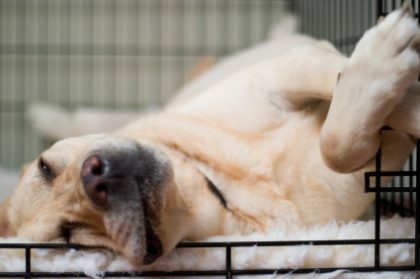 Once your dog is sleeping comfortably through the night with his crate near you, you can begin to gradually move it to the location you prefer, although time spent with your dog—even sleep time—is a chance to strengthen the bond between you and your pet. Whining. If your dog whines or cries while in the crate at night, it may be difficult to decide whether he’s whining to be let out of the crate, or whether he needs to be let outside to eliminate. If you’ve followed the training procedures outlined above, then your dog hasn’t been rewarded for whining in the past by being released from his crate. If that is the case, try to ignore the whining. If your dog is just testing you, he’ll probably stop whining soon. Yelling at him or pounding on the crate will only make things worse. If the whining continues after you’ve ignored him for several minutes, use the phrase he associates with going outside to eliminate. If he responds and becomes excited, take him outside. This should be a trip with a purpose, not play time. If you’re convinced that your dog doesn’t need to eliminate, the best response is to ignore him until he stops whining. Don’t give in; if you do, you’ll teach your dog to whine loud and long to get what he wants. If you’ve progressed gradually through the training steps and haven’t done too much too fast, you’ll be less likely to encounter this problem. If the problem becomes unmanageable, you may need to start the crate training process over again. Separation Anxiety. Attempting to use the crate as a remedy for separation anxiety won’t solve the problem. A crate may prevent your dog from being destructive, but he may injure himself in an attempt to escape from the crate. Separation anxiety problems can only be resolved with counter-conditioning and desensitization procedures. You may want to consult a professional animal-behavior specialist for help. While fleas are active year round in the Pacific Northwest, they become more noticeable in warmer weather. 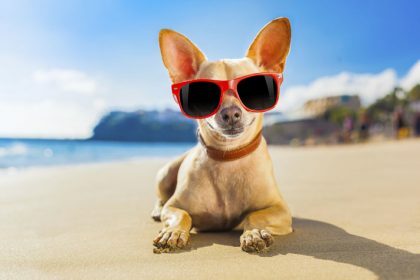 Fleas are problems as they not only carry tapeworm, which can be transmitted to cats and dogs, but they make our pets itchy and scratchy, sometimes to the extent of causing severe dermatitis. The most frequent cause of itchy skin, or pruritis, is the pesky flea. Besides being a household nuisance, multiple flea bites can cause an allergic reaction in some pets that leads to flea allergy dermatitis. Allergies form because of an over reactive inflammatory response to an antigen and usually appear as redness, irritation and inflammation of the skin and ears, although the eyes and nasal passages may also become affected. For pets that develop this allergy, the most important thing is to ensure proper flea control both on their body and in their environment. Just because you don’t see fleas does not mean that your pets don’t have them. Fleas only live on the animals for a few hours to feed, then jump off, live and breed in the environment. Usually evidence of heavy flea infestations is seen on the animal in the form of “flea dirt” or flea excrement. Sometimes, we see the actual fleas (they are fast little buggers!). Fleas are species-specific. So, cat and dog fleas don’t like to eat people! So if you’re getting bit, it’s either because the dog or cat is no longer in the environment and they are hungry or there are so many of them they need more than just your pet(s) to eat. Flea eggs are tiny, shiny, and oval shaped objects that are laid by an adult flea on your pet. Given their shape, the eggs tend to fall from your pet onto bedding, carpet or where ever your pet spends time. A normal adult female flea will lay around 40 – 60 eggs per day which hatch in larvae in 1 to 20 days. Larvae go through several stages of molting as they grow and feed on the “flea dirt” that you find where your pet sleeps or rests—including bedding and carpet. After three molts the larvae pupate within “cocoons” enabling the flea to develop. During this period, the pupae can remain dormant for up to a year but often hatch in 7 to 10 days. Once hatched, adult fleas use vibration and movement find new hosts and will quickly jump to obtain a meal. 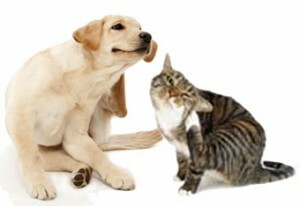 Fleas feed every 4 to 6 hours biting your pet during each feeding. Fleas tend to live several weeks unless otherwise controlled. Flea control starts in the environment. If you have a bad flea problem, washing bedding (your bed and your pet’s bed), regular vacuuming and cleaning are a great start. Then your veterinarian can prescribe a monthly flea control for your pets. 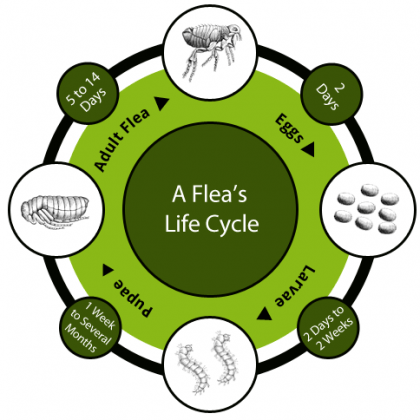 Most flea control products today have quick kill times and break the flea’s life cycle before they can lay eggs. We recommend keeping your pet on regular, year round flea control products. Currently there are both oral (for dogs) and topical (for both dogs and cats) formulations. Oral formulations tend to have a faster kill time than the topical formulations, but also require that the pest bites the pet before being effective. Currently oral combinations (Trifexis) guard against fleas, heartworms, and GI parasites. Topical combinations are effective for fleas, heartworms and GI parasites (Revolution) and flea and tick (Frontline). Generic brands are generally not recommended due to an increase in incidence of adverse side effects and lower effectiveness. Maple Leaf Veterinary Care Center is a full service veterinary practice located in the Maple Leaf neighborhood in north Seattle. Our mission is to provide veterinary care in a relaxed, professional, welcoming setting. We look forward to meeting you and your pet, earning your trust, and exceeding your expectations. I’ve been going to Maple Leaf Vet for almost two years now. They are always friendly and accommodating. My dog actually ENJOYS going there!